A dredge, Indian Ocean, Summer 2007. 1. (verb, definition 1) Removing sediments or other material from one area and depositing them in another area, usually done in a lake or other body of water. For example, harbors and canals are often dredged to removed accumulated sediments so that the water remains deep enough for ships to pass safely. 3. (noun, marine geology) A tool used to collect geological samples from the seafloor. 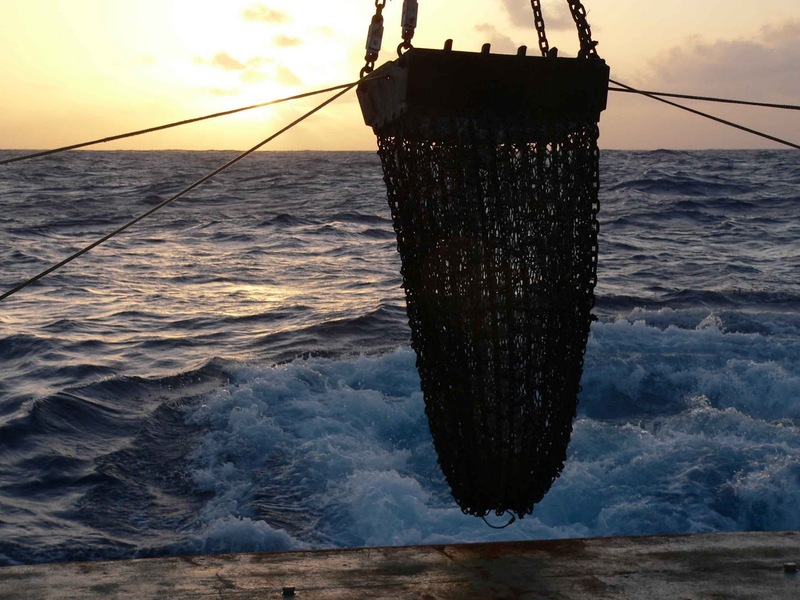 Dredges used to obtain rocks from the seafloor generally consist of a metal net attached to square metal shovel that scrapes rocks into the net. The dredge is attached to a ship with a cable and dragged along the seafloor. After dragging a dredge along the seafloor for a period of time or a certain distance, the dredge is hauled back up to the ship by the cable. When the dredge is successful, the metal net will be filled with rocks. Marine geologists have a daunting task: their job is to learn more about the geology of the seafloor. Land-based geology is challenging enough. Rock layers are eroded, folded, faulted, and covered by alluvium, vegetation, & each other. Rocks can be altered, partially melted, and re-worked into a sedimentary rock. 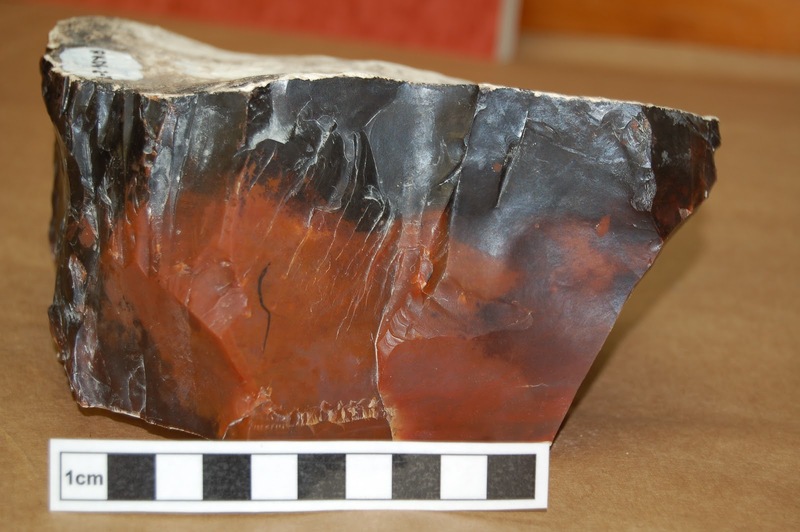 Reconstructing the history of rocks and rock layers is a complex process. However, at least on land you can walk around with your trusty geology tools such as a map, Brunton compass, and GPS unit and do your best to untangle the complex history. You just need your hiking boots, some camping equipment, and perhaps a rugged 4×4. Unfortunately, you can’t just go and walk the seafloor with your Brunton compass. This is because the seafloor is generally covered by several kilometers of water. 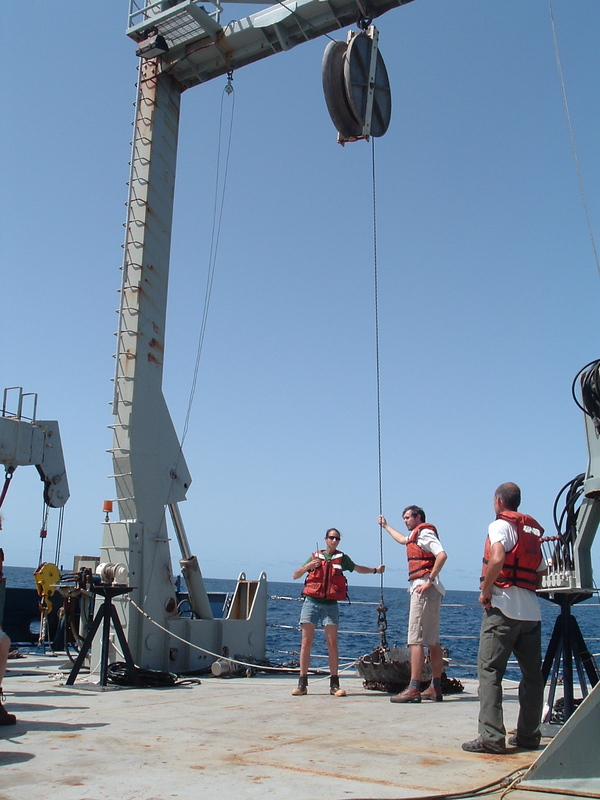 To study the geology of the seafloor, you generally need a research ship and some equipment that allows you to observe and sample the seafloor. This makes marine geology challenging. However, since about 70% of our planet’s surface is covered by ocean crust (and ocean), study of marine rocks is important. In many ways, marine geology is simpler than land-based geology. 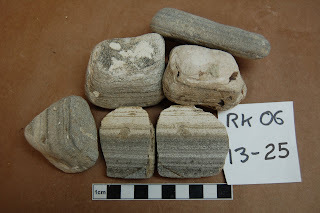 One reason is the oldest seafloor rocks are only ~200 million years old whereas the oldest continental rocks are more than 4 billion years old. This is because the seafloor acts sort of like a giant conveyor belt. 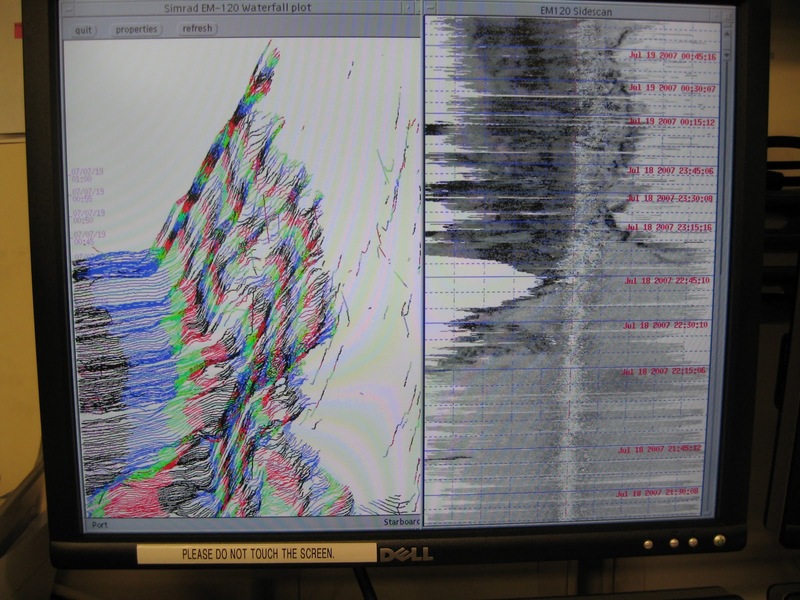 New ocean crust is continually being generated at mid-ocean ridges, which are places where oceanic plates diverge and melts are generated as mantle material rises and decompresses. 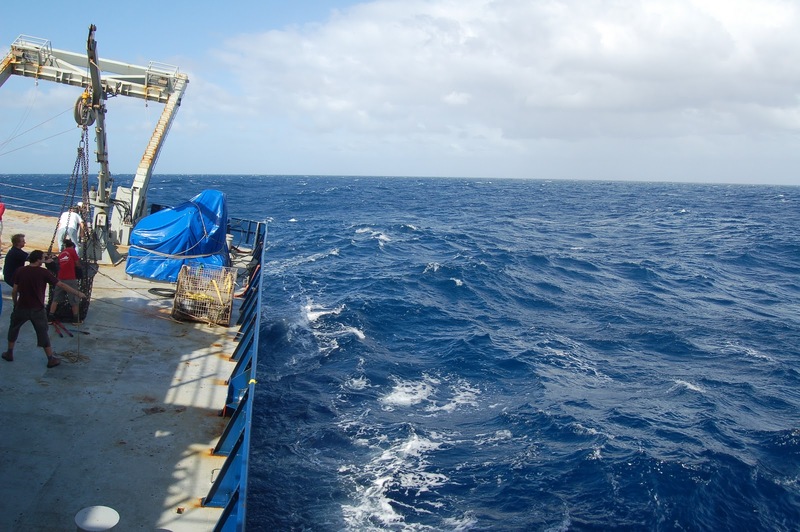 As new ocean crust is formed at mid-ocean ridges, the older material moves slowly but steadily along the conveyor belt away from the ridge towards the edge of the ocean basin. If an ocean basin is young (such as the Atlantic), the ocean basin may still be opening to accommodate new crust. However, in older ocean basins one or more sides of the ocean have generally developed subduction zones, which are places where ocean crust (which is denser than continental crust) is pushed underneath continental crust and back into Earth’s mantle, where it melts and is recycled. Because of this subduction, you do not find very old rocks on the seafloor. Rarely, small segments of oceanic crust are overthrust on a continent edge and preserved. However, the vast majority of ocean crust exists ephemerally (well, on geologic scales anyway) and quickly returns to its mantle maker. Oceanic crust is also more uniform in composition than continental crust and, since it is younger and moves steadily along the conveyor belt, generally has a less-complicated history than continental crust. However, there is still the problem that a marine geologist’s field sites are usually located deep underwater. You need a research ship, which is expensive and requires waiting for a slot on a schedule since there are only a few scientific research ships. Then, you need some equipment that allows you to study the seafloor. 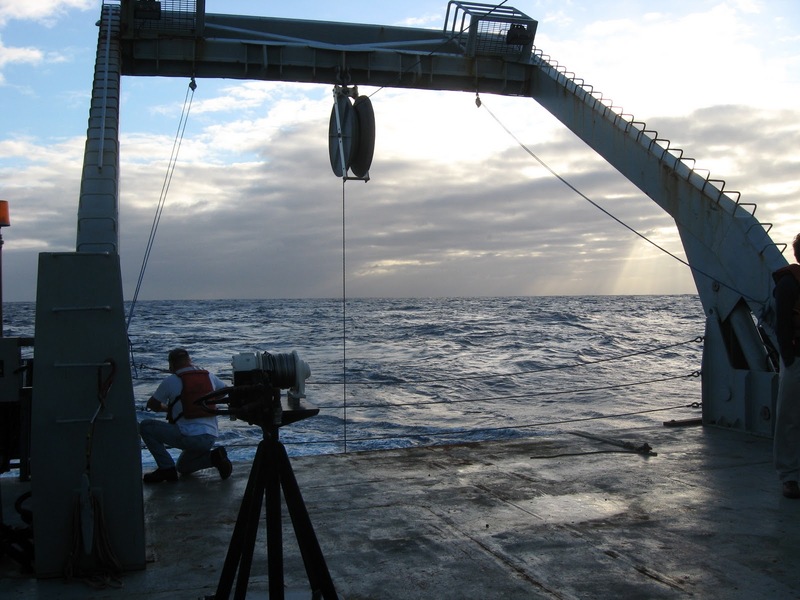 Most research ships come equipped with basic instruments such as multibeam bathymetry, which allows you to map the seafloor, and a gravimeter, which measures gravity. 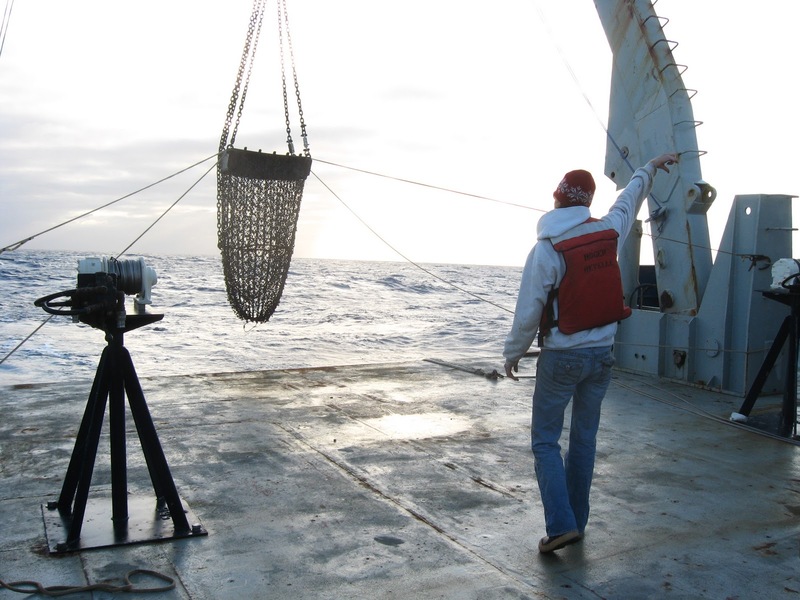 Depending on the goals of your science, however, you generally need to arrange for additional equipment to allow you to study the seafloor. One of the coolest tools we have for studying seafloor geology (and biology and chemistry) is deep-sea submersibles such as Alvin. These submersibles allow scientists to descend to the bottom of the seafloor and actually see- albeit through tiny portholes- the seafloor. These submersibles have arms and other attachments that the scientists can manipulate to obtain samples. However, Alvin is very expensive to operate- about $40,000 USD a day. So while it would be great to obtain all geological samples of the seafloor using a submersible so that the exact field relations are known, this is not economically practical. 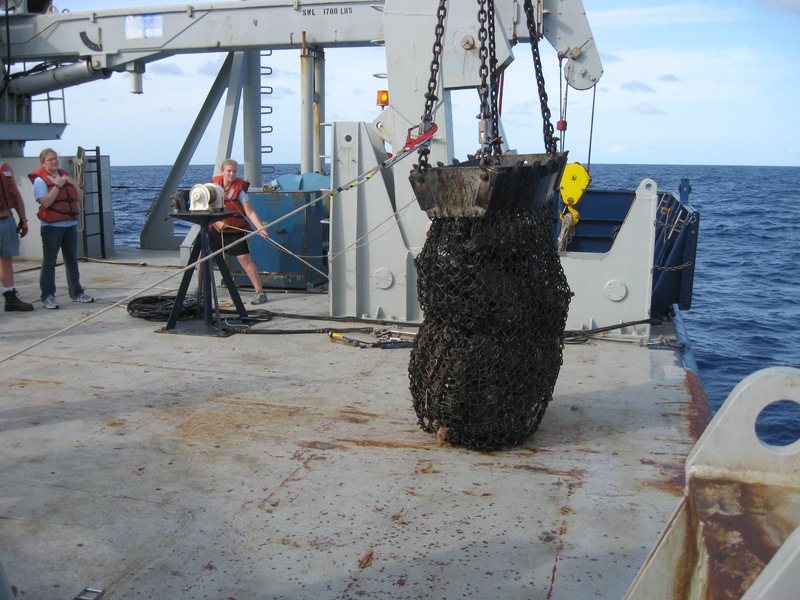 A cheaper alternative is using a dredge to obtain rocks from the seafloor. Dredging is fairly simple technology- basically, you drag a metal basket along the seafloor and hope that some rocks fall into it. You cannot obtain detailed field relations for your rocks, but you can obtain large quantities of rocks relatively quickly and cheaply with some idea of where they’ve come from. Dredging is a little more complicated that it sounds. For instance, you can’t dredge just anywhere. Much of the seafloor is covered with thick sediment, so unless you are dredging at a very young mid-ocean ridge it is important to do careful surveys first. You use multibeam bathymetry and sidescan sonar to look at the seafloor to select locations for dredging. Where are the best places to dredge for rocks? Generally, steep, sediment-free slopes. You can identify good dredging locations using multibeam bathymetry and sidescan sonar. Multibeam bathymetry uses sound echoing to determine the topography underneath the ship and thus allows you to identify good slopes. Sidescan sonar also uses sound, this time looking at the attenuation of sound on the seafloor. Sidescan sonar returns a black-and-white image. The white, “brighter” parts of the image are places where sound is strongly absorbed. The black, “darker” parts of the image are places where sound is strongly reflected. How is this helpful? Loosely-consolidated sediment (the alluvial crap of the seafloor… often called “marine ooze”) strongly absorbs sound while hard rock strongly reflects sounds. So, you want to dredge along a fairly steep slope that returns a dark sidescan sonar image. Side-by-side multibeam bathymetry and sidescan sonar, Indian Ocean, Summer 2007. You also want to map out a track for the ship to follow as it drags the dredge along the seafloor. You want a track that is long enough to catch some rocks, but not too long. 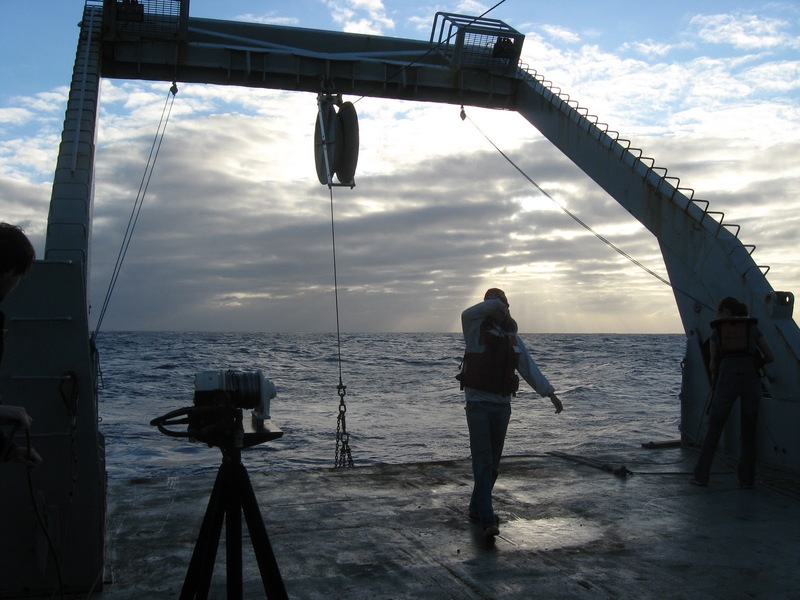 If your dredge track is too long, then you end up sampling a large area of the seafloor and it’s difficult to pinpoint where your samples have come from. Of course, with dredging there is always the possibility that you are picking up a loose rock that has rolled downhill from somewhere else. You need to make sure you understand not only the topgraphy of the area you are dredging but also some of the surrounding topography. 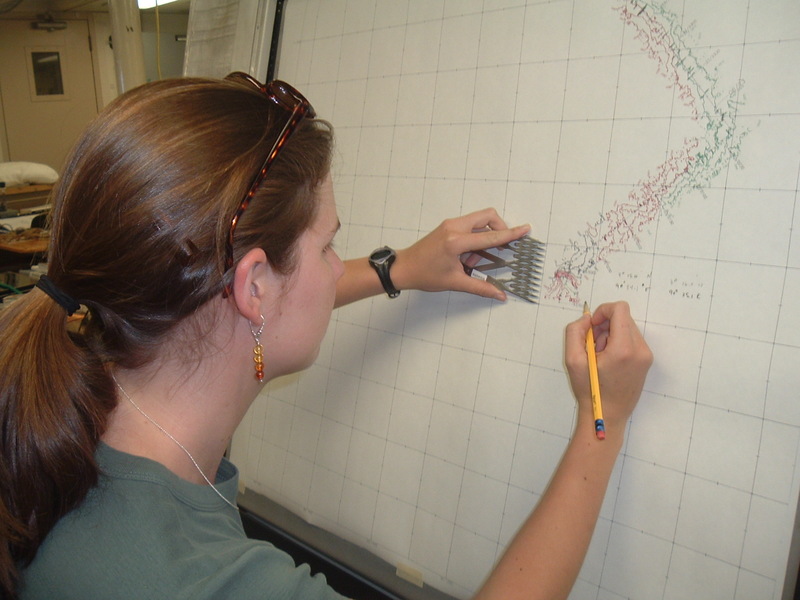 Mapping out a dredge track, Indian Ocean, Summer 2007. When you’ve found a good dredging location, you hook up the dredge to a long, very strong cable which hangs from the ship’s A-frame. 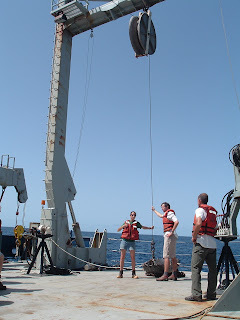 Readying the dredge, Indian Ocean, Summer 2007. Once the dredge is attached, you lower it slowly into the ocean until it reaches the bottom. Lowering the dredge 1, Indian Ocean, Summer 2007. Lowering the dredge 2, Indian Ocean, Summer 2007. Lowering the dredge 3, Indian Ocean, Summer 2007. Until the dredge has been completely lowered, it is important to keep it steady with ropes. As the ship moves, the dredge can easily swing and injure someone. Conditions for dredging are sometimes a bit rough. When the sea is too rough, dredging is impossible as it is too dangerous for the ship to have to keep in a steady position. Rarely, the dredge can become snagged and stuck on the seafloor. This can be very dangerous as it acts like an anchor, tethering the ship in place. Dredges are sometimes lost- the metal net often breaks, and sometimes the dredge is lost completely. Usually, several dredges are kept on hand in case one or two are lost to sea. Keeping lines secure as dredge is moved, Indian Ocean, Summer 2007. After the dredge has been lowered a ways, you attach a device called a pinger to the cable. The pinger makes noises (pings!) that the ship receives and which can be used to determine the depth of the dredge. 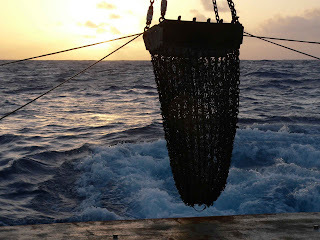 Pinger attached to dredge cable, Indian Ocean, Summer 2007. Then, you go inside and wait for the dredge to reach the ocean bottom, which can take an hour or several hours depending on the depth of the dredge. You have to watch the dredge at all times, moving it up and down with the topography and keeping it from snagging. A skilled dredge-expert is usually hired for this task and is aided by the research scientists. Anxiously monitoring the dredge. The inside ship rooms can be quite cold! Indian Ocean, Summer 2007. Full dredge basket, Indian Ocean, Summer 2007. Caught some rocks, Indian Ocean, Summer 2007. 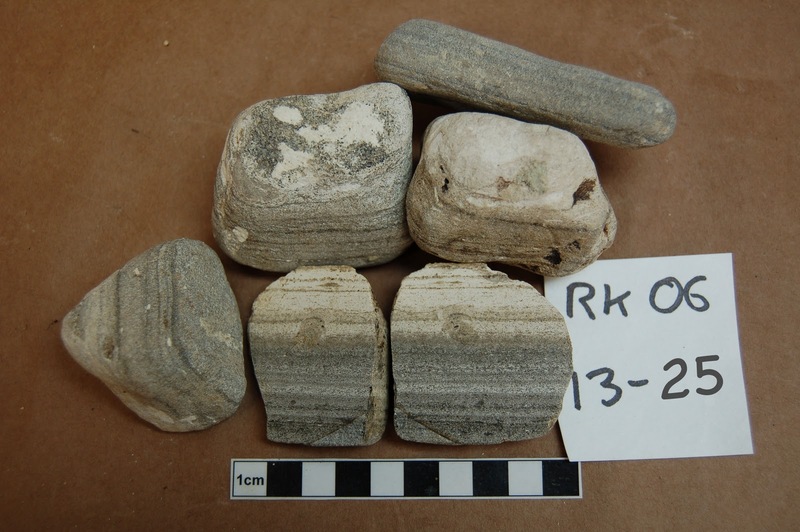 Dredged seafloor rocks generally have thick weathering rims and may also be covered with black iron-manganese crusts. However, once you break or cut these rocks open they can actually be very beautiful… rare treasures dredged from the sea. A rock with a thick iron-manganese rind, Indian Ocean, Summer 2007. Typical weathered seafloor basalts, Indian Ocean, Summer 2007. 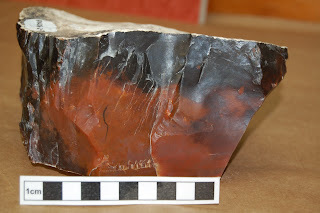 Chert, Indian Ocean, Summer 2007. Brecciated basalt, Indian Ocean, Summer 2007. Basalt breccia, Indian Ocean, Summer 2007. Vesicular basalt, Indian Ocean, Summer 2007. Sedimentary marl, Indian Ocean, Summer 2007. Pink phosphate vein, Indian Ocean, Summer 2007. Botryoidal (grape-like) manganese crust, Indian Ocean, Summer 2007. By the way, all of the pictures in this blog post are ones that I took when I was a student geologist on an expedition to study the Ninetyeast Ridge in the Indian Ocean. There is a great website that was put together about the expedition: Sea90E. Acoustics: Substitute for Superman Vision? I love rocks of any kind or from anywhere .